The Body Glove Performer 11” Blue Ocean Edition (2018) is an improved version of the yellow Body Glove Performer. The previous version was a best-seller; proof of its amazing features. Body Glove has been keen to retain some of those features while improving on others to make a product you cannot resist. How would you like a paddleboard that is sleek and fast, yet easy to paddle and stable on the water and inflates in 5 minutes? Its designer, Luke Hopkins, is a paddling champion who knows exactly what his fellow paddlers need. The board is for people of every skill level. It is a great family board as you can bring your kids or dog along. In case you’re not familiar with the brand, Body Glove is not exactly a household name but it has some of the best products and a beautiful story behind it. It is the brainchild of Bill and Bob Meistrell, two brothers from Missouri. Their first product was a wetsuit designed in 1953. They have always loved the water and even designed a diving helmet from a tire pump and vegetable can at age 14. In 1944, they moved to Manhattan Beach and could not get enough of the ocean. They bought a dive shop that later became Body Glove. So what does the new Body Glove Performer SUP have to offer? The Body Glove Performer offers you value for your money with its great paddling package. In the box are a paddle, board, manual pump, backpack, coil leash, repair kit and dry pouch. The three-piece paddle is adjustable, 68” to 88”, to make it suitable for riders of different heights. The double-layer, durable backpack has been improved from that of the previous board. The pump is a high pressure, dual action hand pump. It comes in a triple layer construction that ensures rigidity and stiffness. Its predecessor only comes with a single layer design and so this is a big improvement. One thing that would cause a paddler to prefer a hardboard to an inflatable board is the possibility of an iSUP not being sturdy. Some brands will sink in the middle even when they are fully inflated, which is not something anyone wants. This triple layer design eliminates the possibility of that problem and lets you have the best time SUPing. 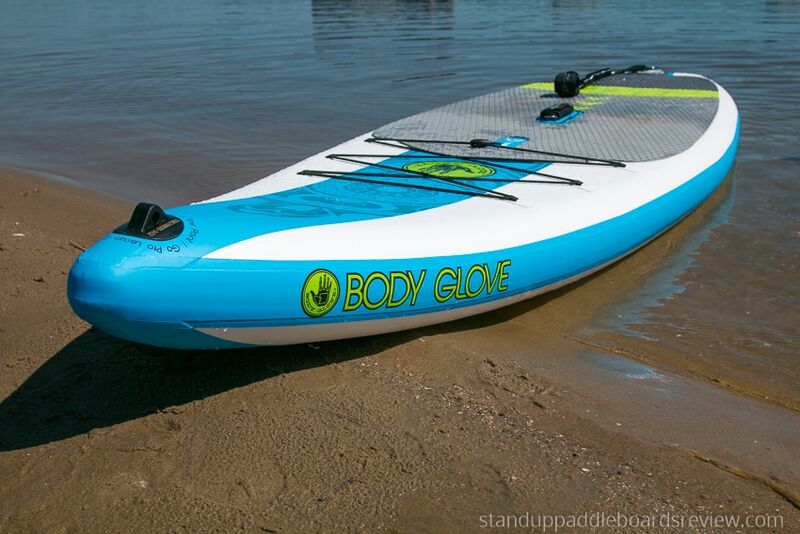 At 34 inches wide, the Body Glove SUP has a large enough deck space. SUP Yoga is becoming really popular and you need ample space for all those cool poses. If you are into SUP touring or SUP fishing, you can strap your gear using the bungee system and you will still have more space for other essentials. The large deck is almost entirely covered in a soft EVA traction pad. It prevents your feet from slipping which can easily happen when the board gets wet. The traction pad is soft and does not hurt your feet when you stand on it for long. Yoga poses also become more enjoyable with this comfortable deck. The Blue Ocean Edition is stable. In addition to being 34 inches wide, the board is 6 inches thick. These two dimensions affect the stability of a paddleboard. A narrow board makes it harder for one to stay balanced while paddling on a thin board does not do well in supporting heavier paddlers. This particular iSUP is thick and wide enough for beginners and riders weighing up to 320 lbs. Two lighter SUPers can even be on board at the same time. One of the many advantages of an iSUP over a traditional paddleboard is the portability and storage. Transporting and storing a fiberglass board can be a headache. Inflatables can be rolled when deflated to fit in your small storage space. When inflated, the Performer weighs 24 lbs and has a center handle for carrying it across the beach. The Performer features a tri-fin system. The fins are made of rubber and permanently fixed. While removable fins can be preferred in some instances, it is easy to lose the screws or the fins themselves, especially if the kids use the board too. Rubber instead of steel contributes to durability because rubber fins cannot break, they can only flex when they hit an obstacle. Being an all-round paddleboard, the Performer 2018 edition is suitable for all water conditions. The PVC material and triple layer construction make it endure conditions that would dent a fiberglass paddleboard. It has a somewhat pointed nose that enhances speed. It may not be the best for serious racing events but it will do well when you are racing against other paddlers using all-round boards. The paddling package being offered is too good for you to resist. If you already have a PFD, all you need to do is buy the Performer new edition and you are ready to paddle. Very few inflatable paddleboards have a package like this. Most packages include a paddle, bag, and pump—at most. If you get this one you will not have to spend an extra dime or time looking for accessories. 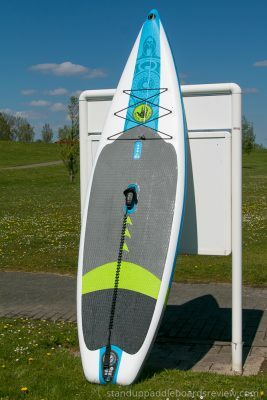 The Body Glove SUP is an all-round board and the paddle is adjustable. Paddleboarding is largely a family activity. You can spend time, having fun with the people you love doing what all of you love. This iSUP makes it even more possible because anyone in the family can use it. The paddle can be adjusted for the smaller kids and young adults. Everyone knows that inflating a paddleboard using a manual pump can be a pain. The exercise, besides being boring, can have you burned out even before you hit the water. This 2018 version of the Body Glove Performer inflates in only five minutes sparing you a lot of energy and time for paddleboarding. Besides, the pump is already provided. You will never have to worry about lost fins and screws. As already mentioned, the rubber fins are permanently fixed so you do not have to remove them when you want to roll your board for storage. Moreover, since they are not made of steel, they do not break. This paddleboard is durable. The Performer Blue Ocean Edition is made with such skill and expertise to ensure that you will not be going back to the market anytime soon (unless it is to buy a second one). The PVC material is state of the art while the triple layer construction is advanced, resulting in a virtually indestructible iSUP. The Body Glove Performer 11” is among the iSUPs that have broken the record of being super light. It only weighs 24 lbs making it very easy to transport. Combine this with the fact that it can be deflated and you have the perfect board for carrying around. The rubber fins are great but they have their limitations. Being rubber, they will not help with tracking and stability as much as steel fins. This is not a big deal unless you are keen on getting an iSUP that tracks really well. Because you have to roll the board for storage, the fins may become bent with time. The good thing is that if you have enough storage space you will not need to deflate and roll it every time for storage. This being an improved edition, people are eager to know if it is any better than the previous one. According to riders, the Performer Blue Ocean Edition is easy to set up. Just as Body Glove claim, it inflates in 5 minutes using the provided hand pump. It is very light and transport is not a problem at all. In water it tracks well, is sturdy and balances as expected. Users have not failed to mention the adjustable paddle. It has made it easy for all family members to paddle in turns. They also love all the accessories provided as they get to save money and the backpack looks really cool. Body Glove is quickly making a name for itself with its products, especially the Performer which is a best seller. The Blue Ocean version still has all the great features that are in the yellow version. The improvements, however, make it even better and worth buying. The construction is awesome and the provided bag is cooler and more durable. I was also surprised by how fast yet stable the board is. Usually faster paddle boards are narrower and more stable boards are wider. Yet is seems that Body Glove have found the optimal balance between the two, creating a board that is fast and stable at the same time. Treat yourself to the new Body Glove Performer and hit the water in style.